Right about this time last year, the Lion of Judah walked into my room and asked me to come away with Him for awhile. If you’ve read the story, you know that sadly, I said “No” (you can read the story here). As it turns out, He did have something important to tell me. Because of my disobedience, it took me longer to get what I could’ve gotten in a day if I had just listened. Lesson learned. I thank God for His ever-willing heart to forgive when we repent! Which is why I’m choosing immediate obedience this time. All this to say that: the Lord has instructed me to hit the pause button on ministry activities for November + December, and spend the last two months of the year waiting on Him for plans + strategies for 2017. So I’m obeying. I sense some exciting growth + changes happening in 2017, and I can’t wait to share them with you at the end of these 2 months! I’ll still write here when there’s something major the Lord asks me to share, but otherwise more frequent updates will be on my Instagram. 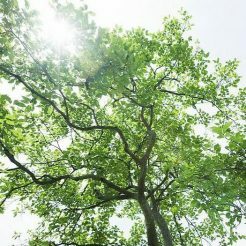 I (and the ministry) are going to get quiet and still before the Lord, and I wanted to just quickly let you know about some of the things that are going to be happening around here in this time of waiting & abiding. 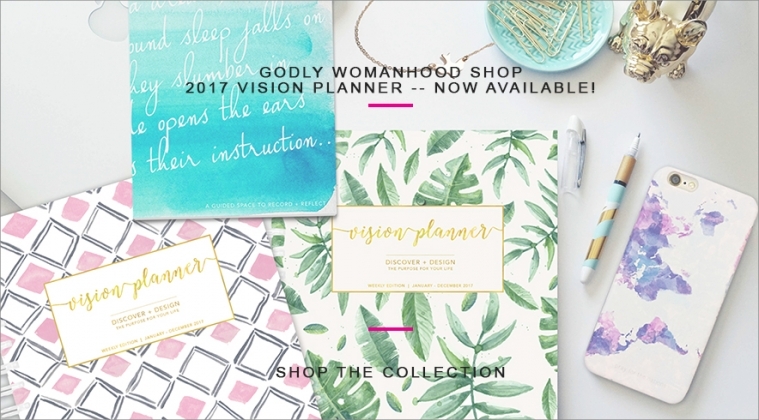 GODLY WOMANHOOD SHOP. We’re slowing down our store activity, but understand that many of you still want to shop for Christmas gifts, so here’s what we’re going to do! Purchases in: October will ship out on November 1st, November will ship out on December 1st (in time for Christmas! 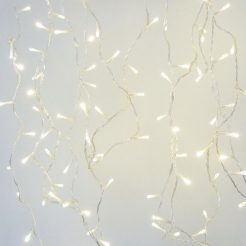 ), December will ship out on January 1st. 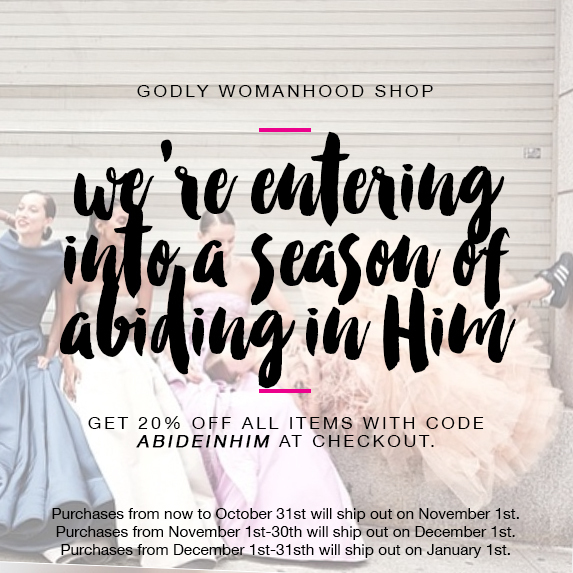 Now you know we only ever have major discounts once a year, so this is huge — get 20% off all items with code ABIDEINHIM at checkout all the way till the end of this year! We hope that this blesses you + helps you to bless someone else, and ask for your understanding in our shipping schedule. CREATECOLLECTIVE. This Saturday will be our last worship night of the year. You’re welcome to join us (info here)! We are also organizing a session with Rick Joyner’s MorningStar Ministries’ prophetic arts team, so do join our community platform if our vision is something you resonate with. PROPHETIC EQUIPPING. Last class happens this month. Stay tuned for updates on plans for next year! PRAYER MINISTRY. We will not be taking any new Prophetic Coaching/Counseling cases for the rest of this year. You are still welcome to submit your prayer requests as our prayer team will still be praying over them. Do note, however, that our monthly prayer meetings will also be put on hold for November and December. We’ve also have something super exciting up our sleeves for you! The only ministry event we’ll be doing in November is a two-day session with the prophetic team from Rick Joyner’s MorningStar Ministries. We’re so excited to empower you to release His peace in your spheres of influence, and establish His kingdom on earth as it is in heaven! Register here. I’m excited for this season of abiding before the Lord, and I’m also excited for what He has in store in the next season! In all seasons, God is good and I’m learning to embrace the process. I’m praying that, as you wind down form this year, each one of you will also get your own unique blueprint from the Lord for his plans for you. 2017 is going to be a year of even greater acceleration + spiritual significance than 2016, and I’m looking forward to us running forward together!